The popular secondary display company called Mimo has recently presented its latest gadget - a USB monitor called iMo Monster. It is worth mentioning that among other touchscreen monitors from Mimo, this is now the largest in the company's submonitor class. 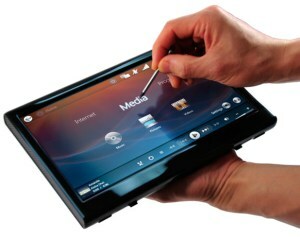 The company's new device has a 10-inch touchscreen display that boasts a 1,024 x 600 resolution panel. Mimo's device weights only 1.77 pounds. It also supports both Windows and Mac OS X platforms. In addition, through USB connection you can recharge the monitor and easily connect other devices to it. Thus there will be no need for additional VGA cables or video cards. The iMo Monster also features a stylus and a 4.5-inch USB 2.0 cable. Mimo's gadget provides sharp graphics and a wide range of business applications.